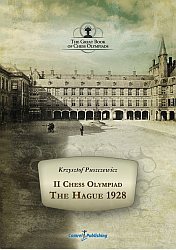 - PDF (Woblink) 1927 The First Chess Olympiad - London 1927 was the first official Chess Olympiad. 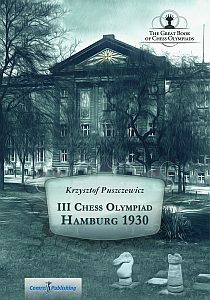 Most of chess stars of that time took part in the tournament, among them the future world champion - Max Euwe. 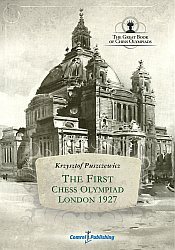 The First Olympiad is the least documented one. Nonetheless, the author managed to find a lot of new interesting information and unique photographs. 4 Prague 1931 Ready to publish. In the queue. 5 Folkestone 1933 Ready to publish. In the queue. 6 Warsaw 1935 Ready to publish. In the queue. 7 Munich 1936 Ready to publish. In the queue. 8 Stockholm 1937 Ready to publish. In the queue. 9 Buenos Aires 1939 Ready to publish. In the queue. 10 Dubrovnik 1950 Ready to publish. In the queue. 11 Helsinki 1952 Ready to publish. In the queue. 12 Amsterdam 1954 Ready to publish. In the queue. 13 Moscow 1956 Ready to publish. In the queue. 14 Munich 1958 Ready to publish. In the queue. 15 Leipzig 1960 Ready to publish. In the queue. 16 Varna 1962 Ready to publish. In the queue. 17 Tel Aviv 1964 Ready to publish. In the queue. 18 Havana 1966 Ready to publish. In the queue. 19 Lugano 1968 Ready to publish. In the queue. 20 Siegen 1970 Ready to publish. In the queue. 21 Skopje 1972 Ready to publish. In the queue. 22 Nice 1974 Ready to publish. In the queue. 23 Haifa 1976 Ready to publish. In the queue. 24 Buenos Aires 1978 Ready to publish. In the queue. 25 La Valletta 1980 Ready to publish. In the queue. 26 Lucerne 1982 Ready to publish. In the queue. 27 Thesaloniki 1984 Ready to publish. In the queue. 28 Dubai 1986 Ready to publish. In the queue. 29 Thesaloniki 1988 Ready to publish. In the queue. 30 Novi Sad 1990 Ready to publish. In the queue. 31 Manila 1992 Ready to publish. In the queue. 32 Moscow 1994 Ready to publish. In the queue. 33 Yerevan 1996 Ready to publish. In the queue. 34 Elista 1998 Ready to publish. In the queue. 35 Istanbul 2000 Ready to publish. In the queue. 36 Bled 2002 Ready to publish. In the queue. 37 Calvia 2004 Ready to publish. In the queue. 38 Turin 2006 Ready to publish. In the queue. 39 Dresden 2008 The author is writing a book. Work in progress. Finishing stage. how is this series progressing? We decided to complete this series in Polish language first. After that we will get back and translate all eBooks for English. We are in halfway now and have published over 10 Olympiads already.